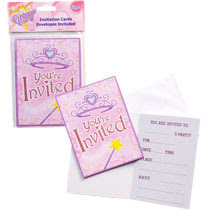 Initially I had visions of handmaking festive invites with clever poetry, Cinderella pics, and a Halloween background. (daughter’s name) is no longer 2! come in your costume, there is fun for all! However, when you are really busy you come to a point where you need to simplify as much as possible. So this will be replaced by Dollar Tree invites (hey- they get the job done, right? Will people not have as much fun because the invitation was lacking in creativity? I am hoping the answer is no!) I have sat down with my daughter and come up with a list of friends. She pretty much likes everybody (except strangers and bad guys) so coming up with people will be no problem. There won’t be a lot of time for party set up, so I am thinking of simple ways to spice up the party area. I want the focus of the decor to be a decorated dessert table ( I will come to that later in this post). For the table, I was going to make a “Bibbety Bobbety Boo Happy Birthday to You!” banner but it might be a bit long :). I have Halloween party decorations that we plan on using as well. Easy Peasy! 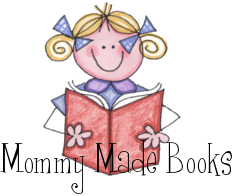 I wrote a Mommy Made book for my daughter’s birthday (titled Bibbety Bobbety Boo, of course!) that my husband will read to the kids. It is a story about a girl named Boo and her adventures on her way to her birthday party. It is filled with some of her favorite things- from dinosaurs to lollipops! A friend of mine came up with altering the familiar Duck, Duck, Goose game to “Bibbety Bobbety, Bibbety Bobbety, Boo!” I thought I would get a soft wand that “it” could use. I also play the game with felt squares so that there everyone has a place to sit and there is no question where the child needs to go. So I might pick up some felt in Halloween colors for the occasion! The kids will then go trick-or-treating with the bags made at the beginning of the party. Since the party will be held at our church, I can use some of the empty classrooms as “houses”. I have enlisted a niece and nephew to pass out candy for the little trick or treaters! We will come back from trick or treating to attend the ball (dancing to Halloween and Disney princess tunes with bubbles). I have a back up “pin the spider on the web” game in case we have tons of extra time, but as I have learned- you usually don’t get through everything during a party! Last thing during the party-treats and opening gifts! Which brings me to my next step…. Does that seem like a lot of sweets on Halloween? I might cut down the treat table just for the amount of sugar these kiddos will get later that night! Well, there is the start of our party plans! There is still a lot of work I need to do, but it is slowly coming together!! What are some of your favorite Halloween plans? Isn’t this time of year wonderful? It just comes and goes much too quickly! This entry was posted in celebrations, Halloween, mommymadebook and tagged party on October 3, 2010 by ktoponce. Dino Learning- Our Expedition to Prehistoric Times! played, played, and PLAYED with the plastic dinosaurs! This helped my Boo to learn the dinosaur names (we taught her the correct names of several of the dinosaurs) and their eating habits. Boo went through a “no way am I eating meat” phase thanks to T Rex. While we played we sorted the dinosaurs, role played with them, had them speak Spanish, talked about manners, etc. visited a local dinosaur park again, and again, and again. . . This place is great for Boo because she can see full size statues of the dinosaurs. we made a mommy and me book! Making another book with my daughter has been on my to-do list for a long time. I was so faithful at making her a book a month, and then my daughter became an active toddler and. . . well, my time disappeared! Some dinosaurs were not at the dinosaur park (shock to me!) In that case, I just downloaded an image of that particular dinosaur. We ran out of room in her book so I had to put four pics on the inside back cover. I really should just make a sequel with her because she is quickly adding more dinosaurs to her schema! You may have noticed the little meat/plant stickers on each page- those represent what each dinosaur ate. The reason why we put those stickers on? My daughter is very interested in their eating habits! 🙂 We also sorted dinosaur stickers and added those to each of the pages. We found this great dinosaur book in the dollar bins at Target. It is a little too advanced for my Boo, but she loves looking and learning about the dinosaurs! 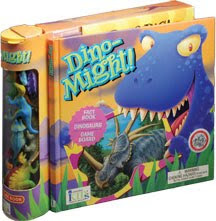 dinosaur game– we found this for a steal of a deal at a local bookstore. The game comes with a tube of plastic dinosaurs- and each dinosaur is labeled so I didn’t have to play the guessing game trying to figure out their names! I love that! This game also includes a short book with facts about different dinosaurs. And although the game itself was a little tricky, we tried it and had fun! 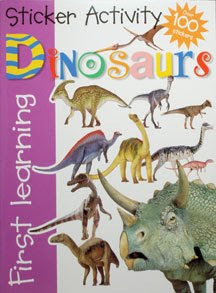 dinosaur sticker book– this was also found at a local bookstore. My Boo is into stickers lately- so this was perfect. The kids match the sticker to the dinosaur shape- another great skill. 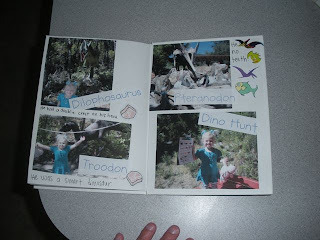 We have had so much fun learning about dinosaurs- and I know we are nowhere near the end of learning about these prehistoric animals- but I just wanted to share with you some of the activities that have helped our learning grow! Remember to keep your manipulatives/books/games that you make- you never know when your child will pick up interest in that particular topic again! 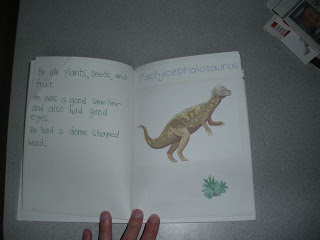 This entry was posted in dinosaurs, explorations, mommymadebook on September 11, 2010 by ktoponce. I have been eager to have my daughter “write” in a weekly journal as part of our Sunday routine. I want to remember as much as I can of her thoughts at this humorous and curious stage. I found the following list of prompts online, put them all together, and uploaded it to our site’s wiki. I made a blank journal by binding together a stack of white paper and creating a personalized card stock cover. I will choose one or two prompts each Sunday, have her share her answers, I will write them down, and she will illustrate. 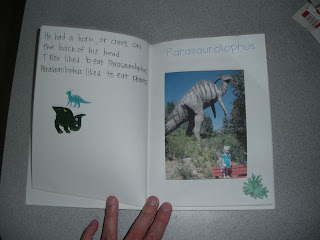 So far we have written about her favorite dinosaur (Parasaurolophus). It is a simple and easy thing to do with your kiddo and yet you are helping to keep those precious memories to enjoy for many years to come. Go start a journal with your kids! This entry was posted in literacy, mommymadebook, writing on August 24, 2010 by ktoponce. So July is already in full swing… it’s not too late to post our June’s Book project though!! We are transitioning from just Mommy Made to Mommy & Me Made Books. My little one is now able to participate more and more in the book making process. 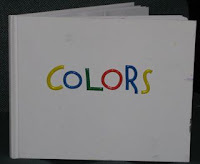 As we learned about a new color, we painted and did a collage in a blank hard bound book. 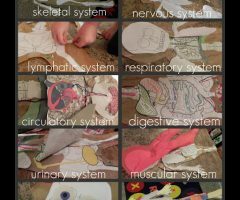 She painted, colored, and glued the pictures all by herself! This book took several weeks to create- starting with our color days back in April. This book is finished- all ready to go with a colorful title! This entry was posted in colors, mommymadebook on July 6, 2009 by ktoponce. I have been working with my little one on her colors recently and thought that I would incorporate her love of animals with reviewing this concept! We went to the ZOO not too long ago and I was hoping that I could use my own photographs for this book but it didn’t work out as planned so THANK goodness for google! I was able to find animals for 10 colors and I am thrilled with how the book turned out! 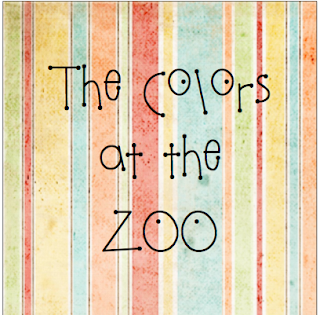 Here is a blank pdf of Colors at the Zoo for you to download. Just print and add the name of an animal for each color. 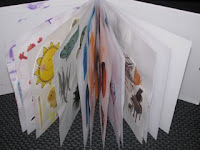 You can then add photographs or have your little one draw the illustrations! This entry was posted in mommymadebook on May 26, 2009 by ktoponce. One of the most important lessons you can teach your child is of their divine nature and self worth. I want my daughter to know more than anything else that she is loved by her family here on earth and by her Heavenly Father. So naturally the idea came to me to write a little book for her about just that! I used the words to the familiar primary song I Am a Child of God by Naomi Randall and inserted pictures of her that followed the text. It has turned out really cute and my daughter had me read a few times already today. Here is a pdf to download of the text to Naomi Randall’s song- download and insert your own images or have children illustrate. Then print, staple, and voila! 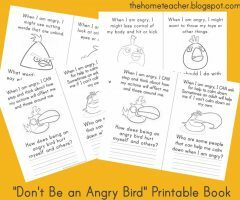 Or to make them a little sturdier- gather up old board books or buy some blank books from barebooks.com and print the story on sticker paper. Attach the paper to the pages of the book. Either way, the finished product is a mommy made book! 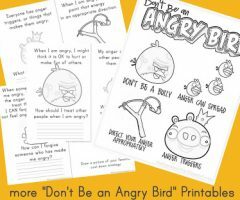 I have an upcoming post on the I am a Child of God quiet kit- I have been compiling a lot of great activities that I have found online (as well as some mommy-made ones). 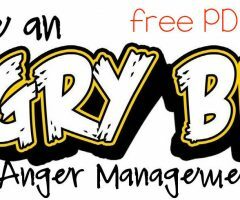 This will be a great resource to helping our little ones stay reverent at church and learn about Jesus! This entry was posted in mommymadebook on April 3, 2009 by ktoponce. Jacs is developing a real love of books. She has some new favorites this month: We’re Going On a Bear Hunt, Hop on Pop, and Mr. Brown Can Moo- Can You? These books have great rhythm- plus she is obsessed with certain images- like upside down Mr. Brown or a cat slurping milk (She will point to her milk, then the cat’s milk, then to her milk again… she is making her first text to self connections! ) To broaden her little book schema, I wanted to make a book about a primary song… and since we sing Popcorn Popping on the Apricot Tree with Jacs, I thought this would be great one to start with! I wanted to have her be my model for the pics. Since she can’t do any of the signs yet, I had to do a little photo editing to make it all come together. Enjoy!!! This entry was posted in mommymadebook on February 14, 2009 by ktoponce. I wanted to make Jacs a special book for this month… I was considering making her a book of the inauguration, and I still might make her one if I have time, but I knew deep down that this month had to be a Grandma Findlay book. I contemplated writing a story about her life, or the memories I have of her- and was struck with this short excerpt from Grandma’s book Back To Innocence. Its a story of the desire she had as a young child to receive a doll for Christmas, being disappointed about never receiving one- and learning how food is more important than trivial gifts. This special tribute book is very meaningful to me because it is written in my Grandma’s own words. This entry was posted in mommymadebook on January 16, 2009 by ktoponce. As some of you might know, Jacs is having a kitchen themed Christmas this year. We got a really good deal on a play kitchen, bought her some pots and pans, and of course I had to make her some related books! She loves to point at things and ask “that?” so I decided to make a collage book for that very reason! I made her a book about fruits and a book about veggies- and she can point and ask away! This entry was posted in mommymadebook on December 6, 2008 by ktoponce.